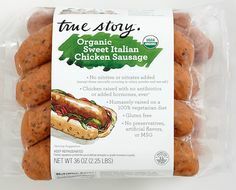 I’ve found this Sweet Italian Chicken Sausage I buy at Costco is really nice to have on hand. 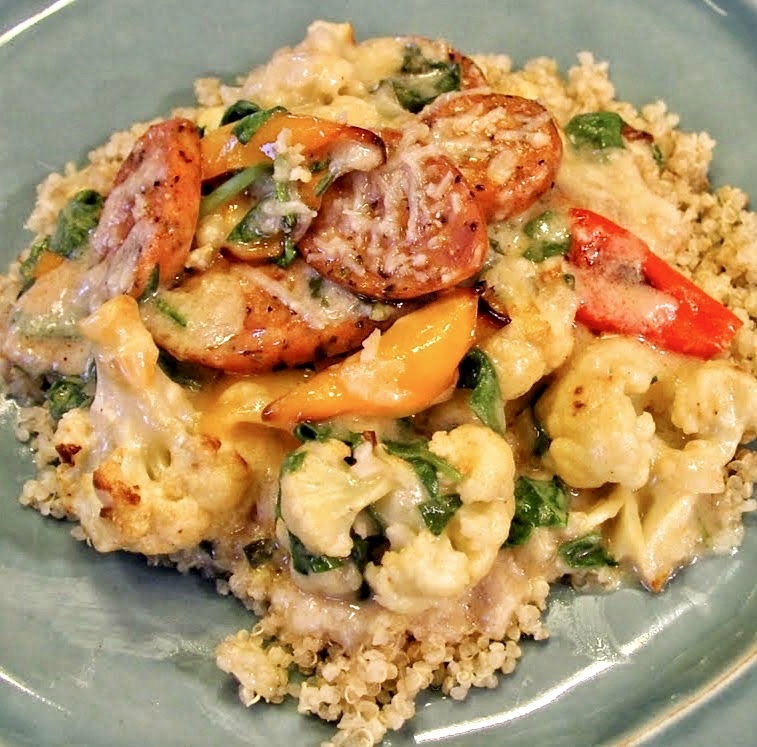 It’s super convenient and versatile; great chopped into scrambled eggs, grilled and put on a bun or sliced thinly in a pasta dish or soup like Chicken Sausage, Vegetable and White Bean Soup with Ricotta. 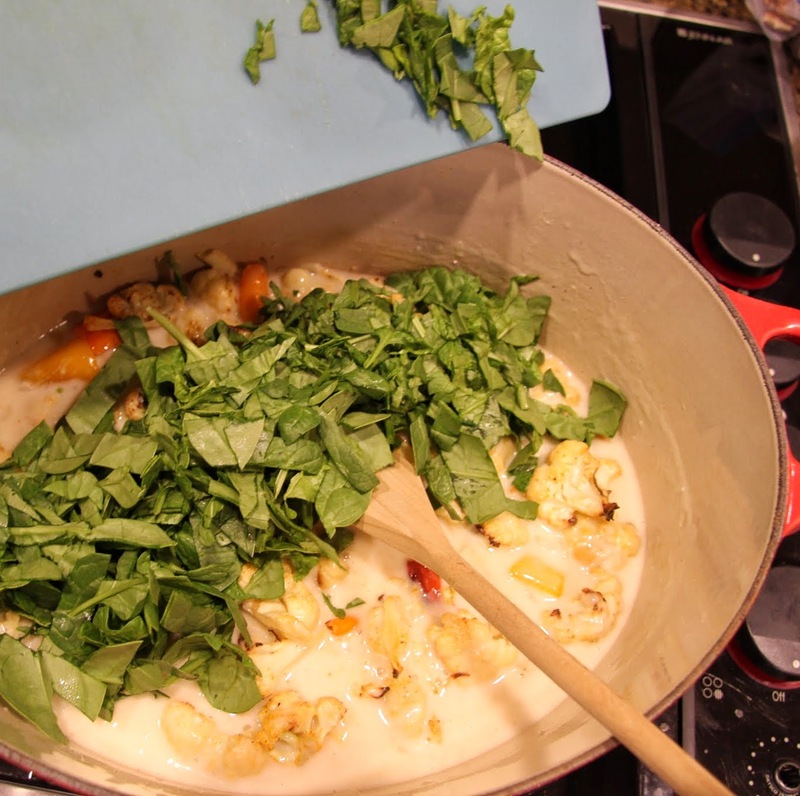 A few nights ago we put it to good use in this creamy, cheesy, chock full of veggies gratin. Hailey asked if I could make it twice a week so I guess she liked it a lot. I served it with quinoa but rice or pasta would be equally good. Of course, if you’re cutting carbs, it’s a complete meal itself. 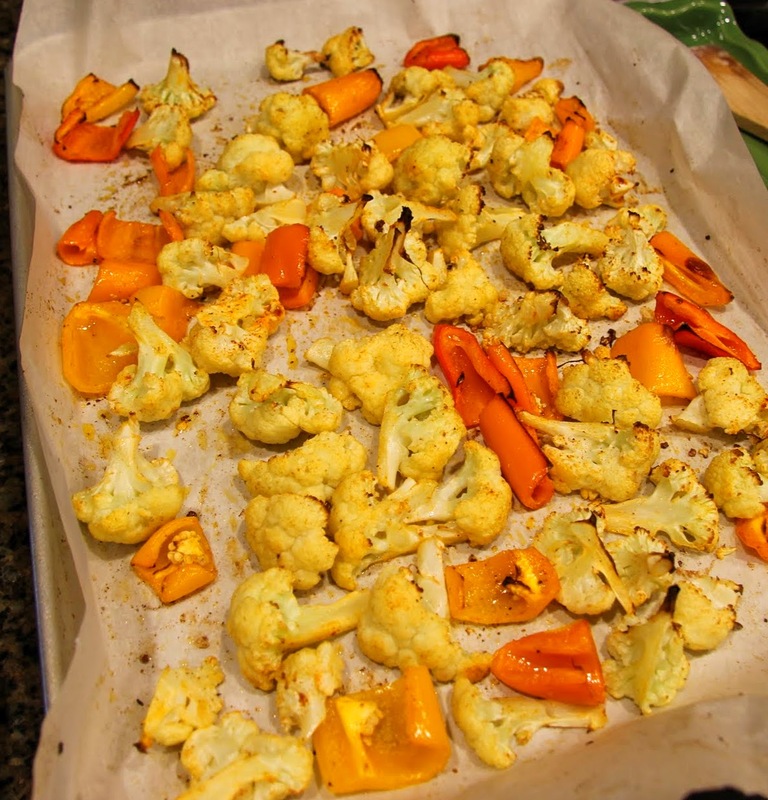 Roasting the cauliflower and peppers may seem like a pain but I promise it’s worth it because the peppers become so sweet and the cauliflower is way more flavorful than if you steamed it first instead. 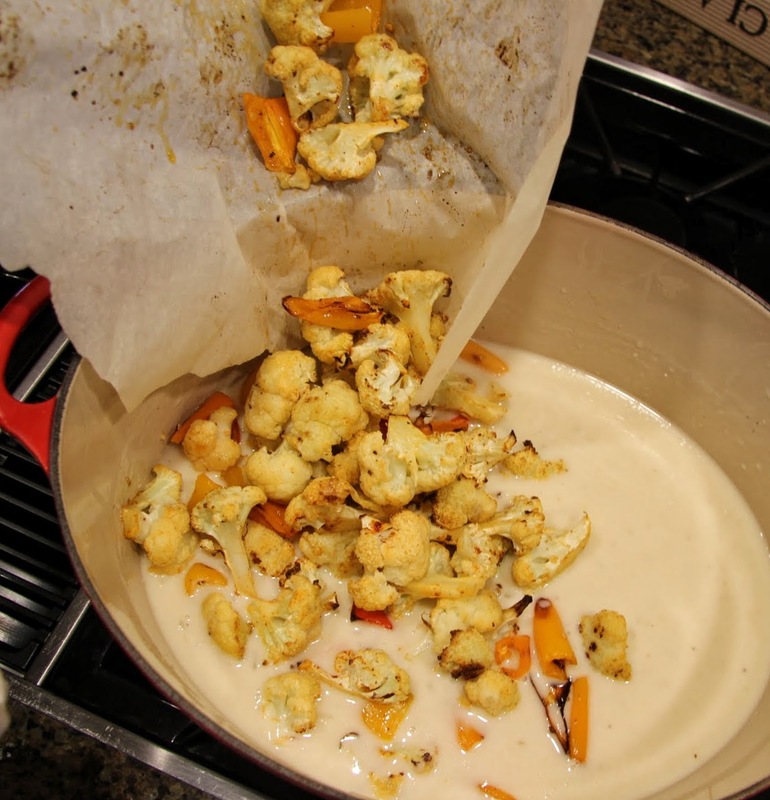 Besides, I think it’s easier than steaming them, especially if you line your pan with parchment paper for super fast clean up, and you can make the sauce while they roast. 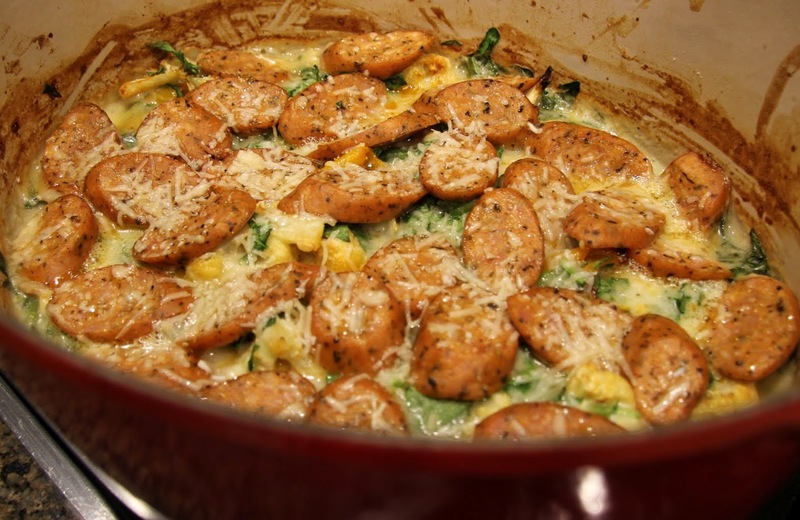 Of course, you can use any kind of precooked sausage/kielbasa you want for this recipe, just make sure the quantity is the same. 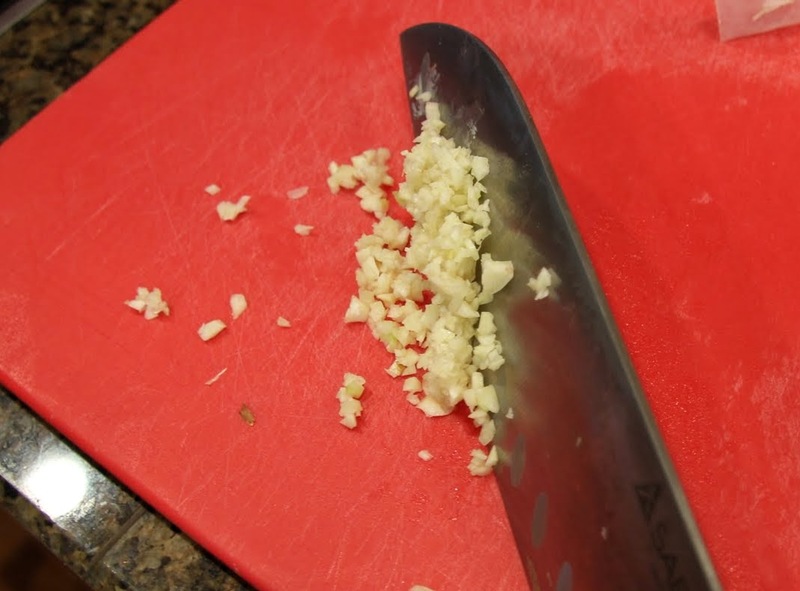 You can also use one of those handy precut bags from the grocery store but you’ll want to cut them a bit smaller. 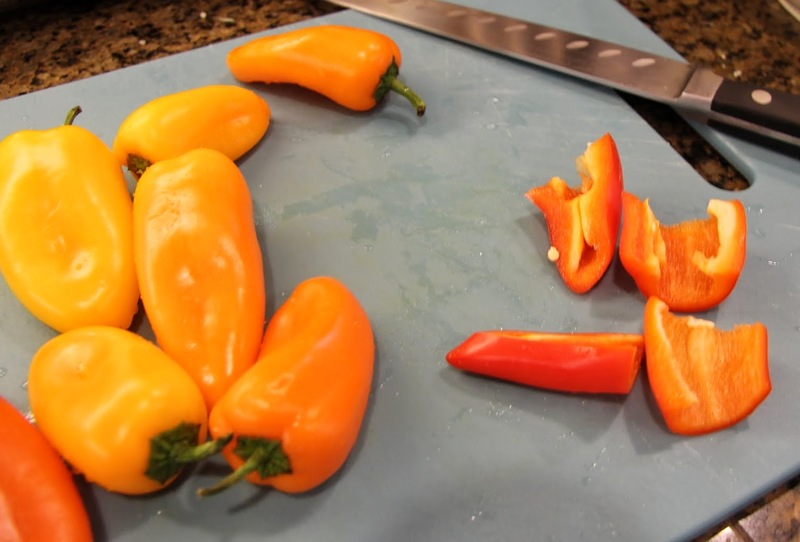 Core and cut peppers into approximately 2″x2″ chunks, I just quartered the mini peppers. Line a half sheet/jelly roll pan with parchment paper. 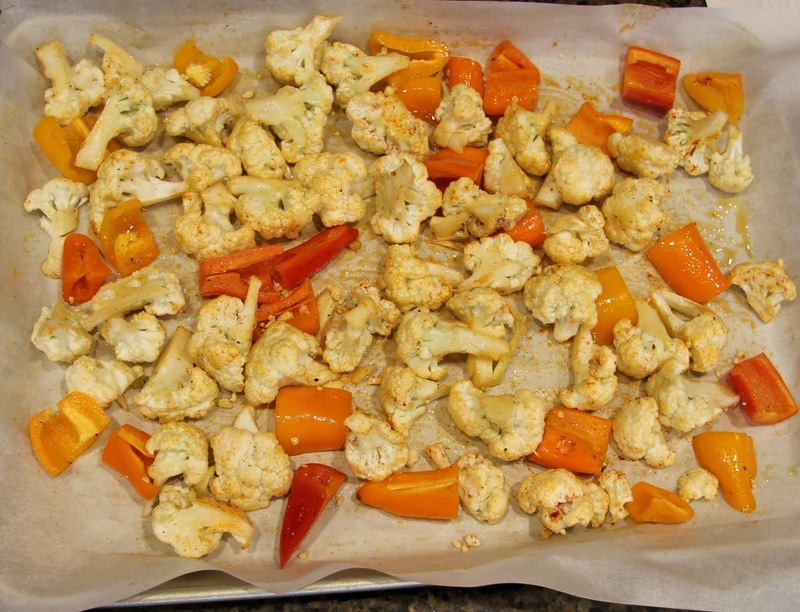 Spread the cauliflower and peppers out evenly and add olive oil, salt, pepper, and smoked paprika, toss to coat. Roast in preheated oven for 15 – 20 minutes, until the edges start to brown. 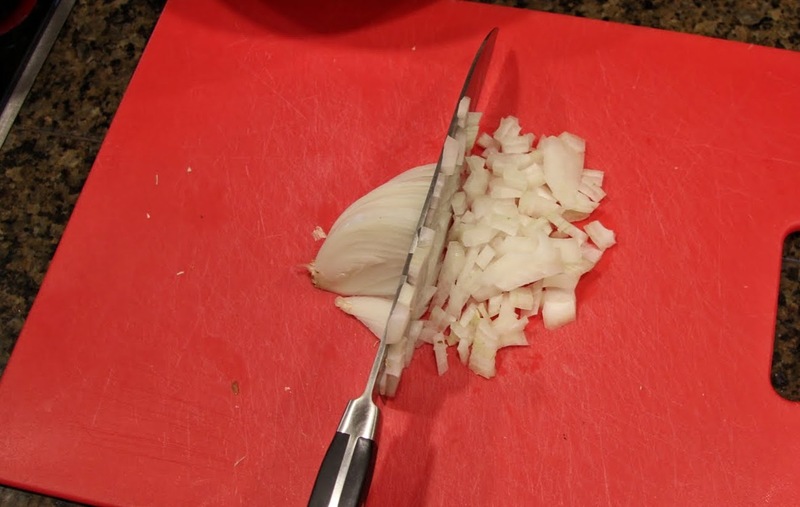 Meanwhile, dice about 1/4 of the sweet onion (to yield 3/4 cup) is very small pieces. 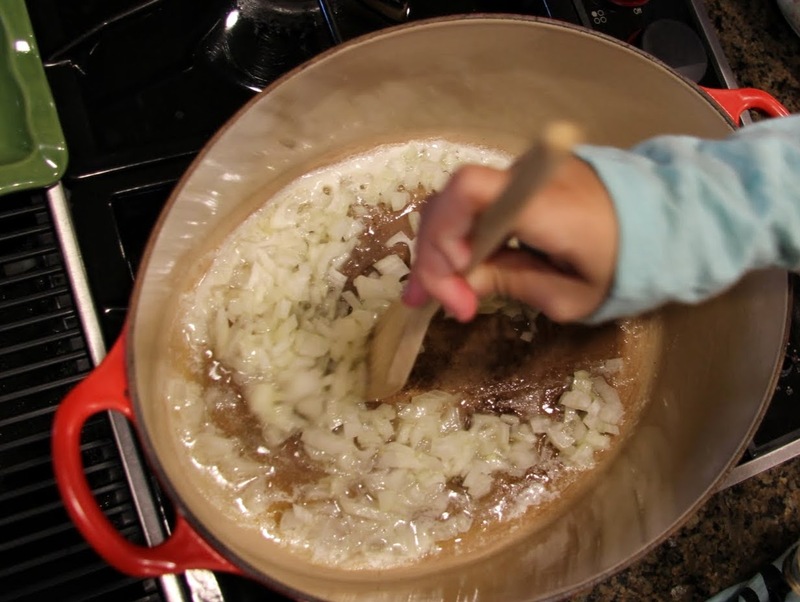 Add the onions to the pan and cook over medium heat until translucent, stirring often. 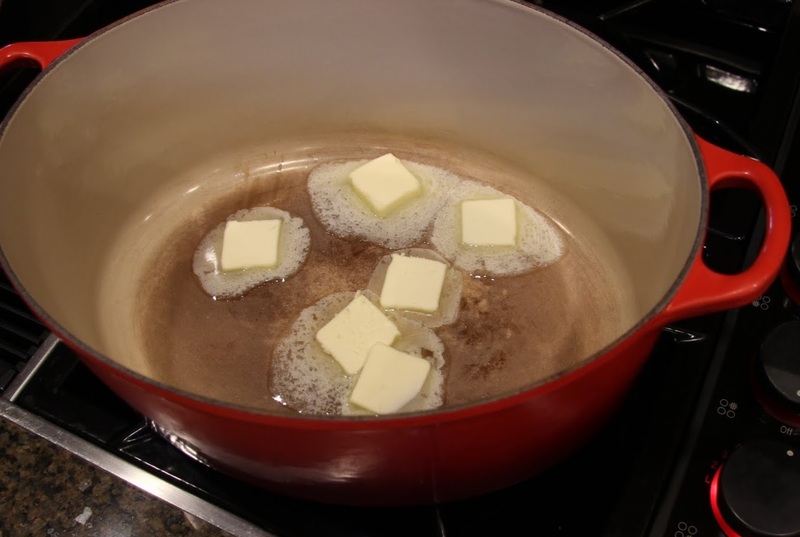 If they start to brown, turn the heat down a little because you want them soft but not caramelized. 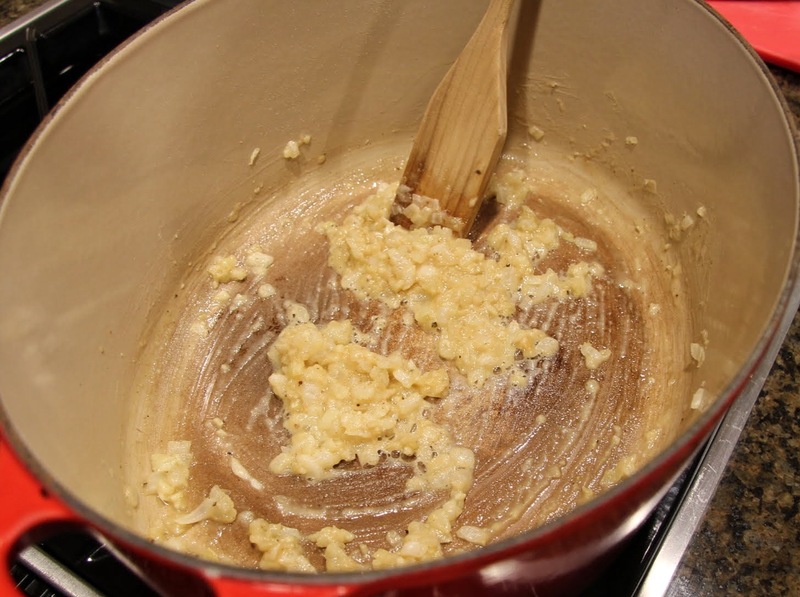 While the onions cook, measure out the chicken stock and milk and microwave for a few minutes so it’s hot when you add it to the roux. 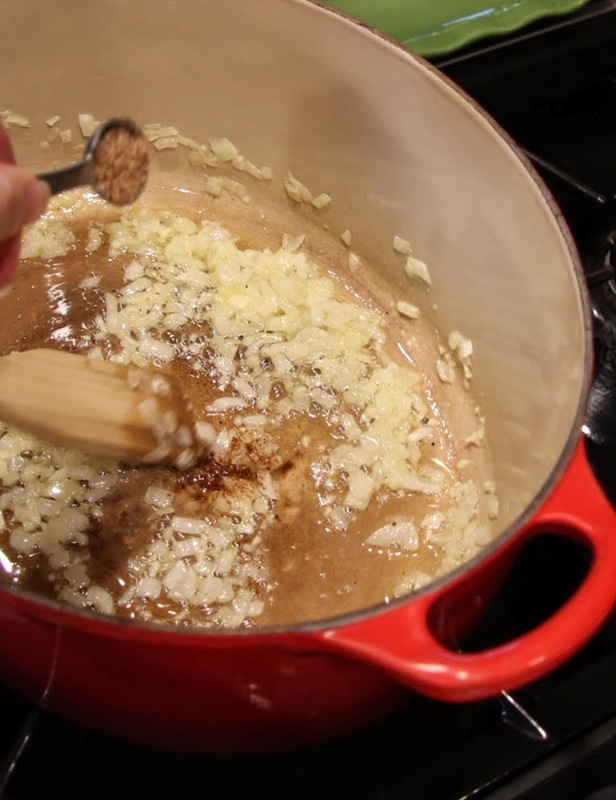 Mince the garlic and add it once the onions are cooked. 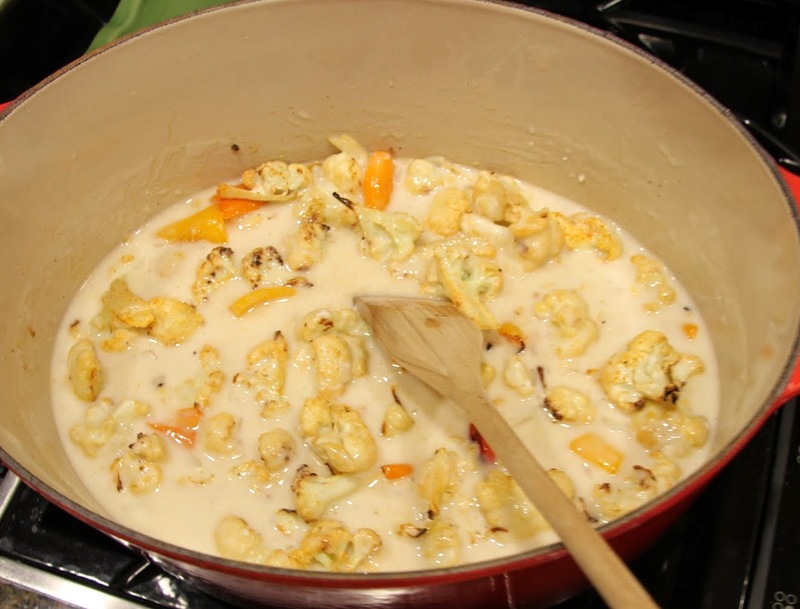 Add salt, pepper, and nutmeg and cook for a couple minutes, stirring often. 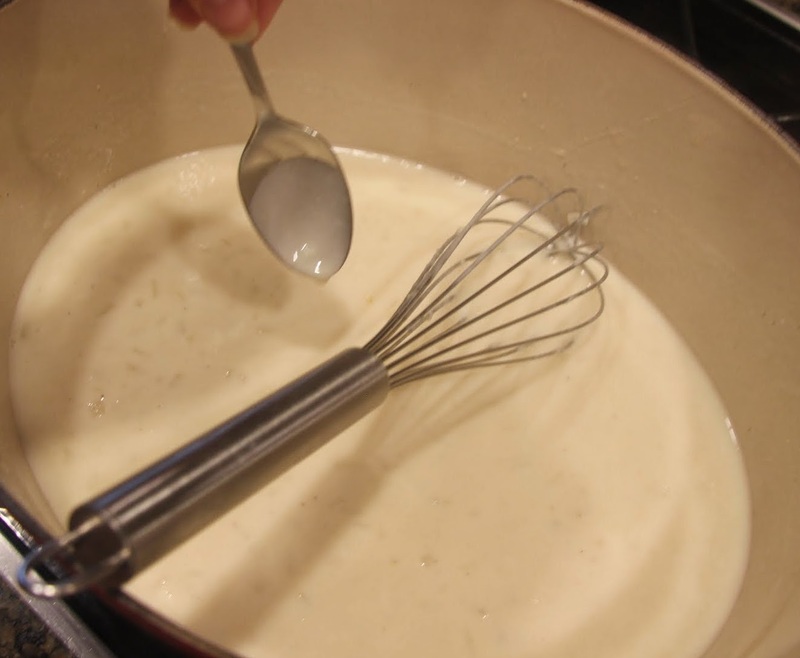 Add flour and cook the roux, stirring often, for another few minutes to get rid of the raw flour flavor. 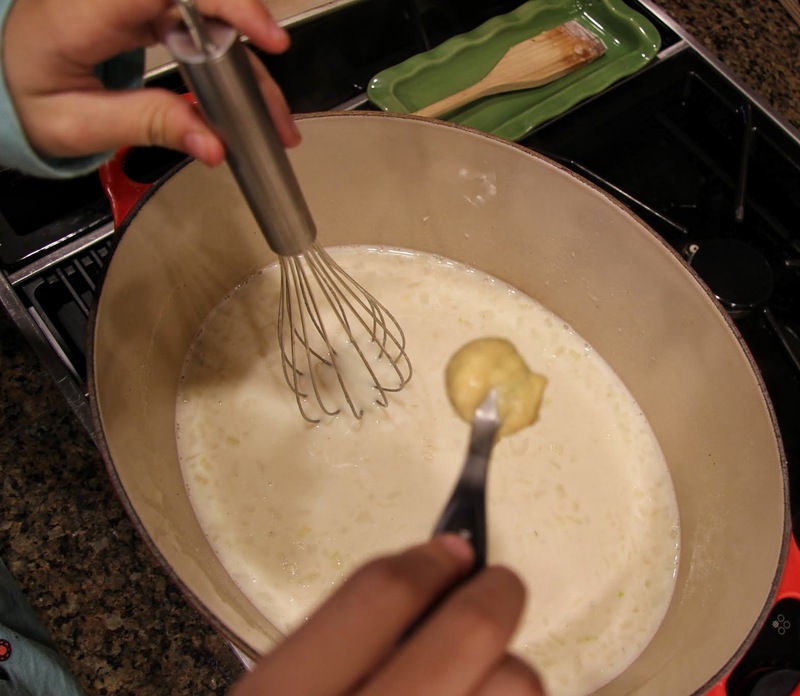 Using a whisk to stir, add chicken stock/milk very gradually, stirring until smooth after each addition. 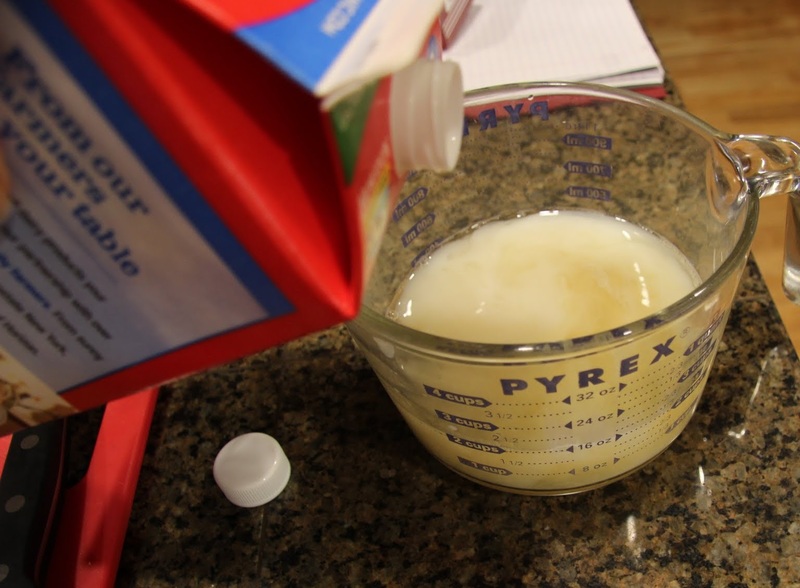 To avoid lumps, I generally start with about 1/2 cup at a time until it’s the consistency of heavy cream, then I add the rest of the liquid. 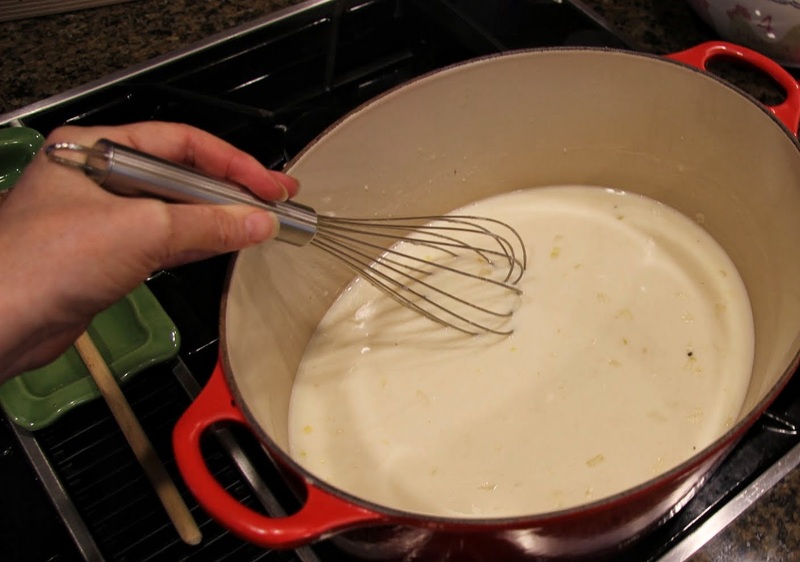 Once all the liquid is added, cook over medium heat until it thickens enough to coat a spoon, about 10 minutes, stirring often to avoid sticking. 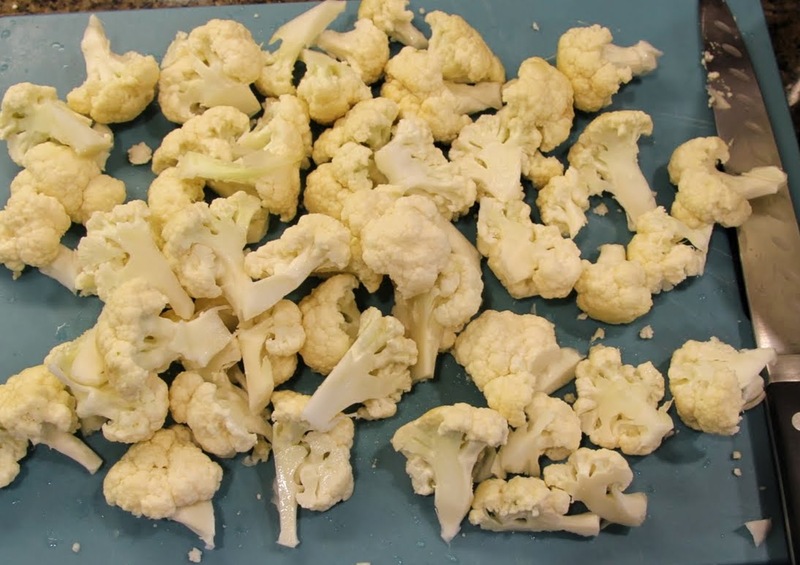 Once your vegetables are roasted, remove them from the oven and set aside. Leave oven on but reduce the heat to 375 degrees. 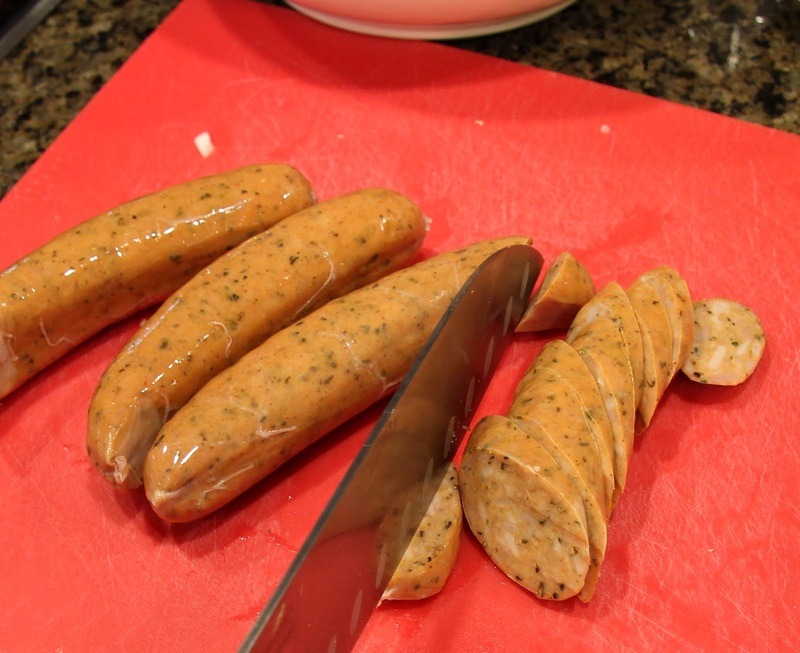 While your sauce is cooking, slice up the sausage and set it aside. 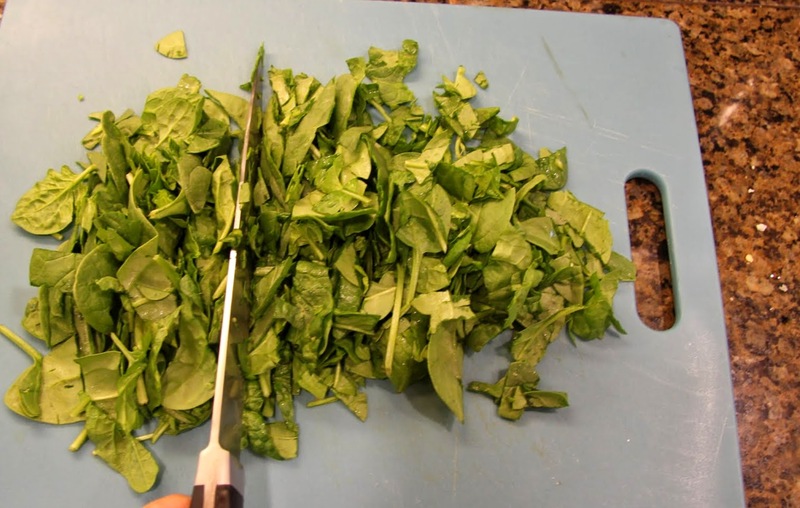 Also, chop your spinach and set aside. 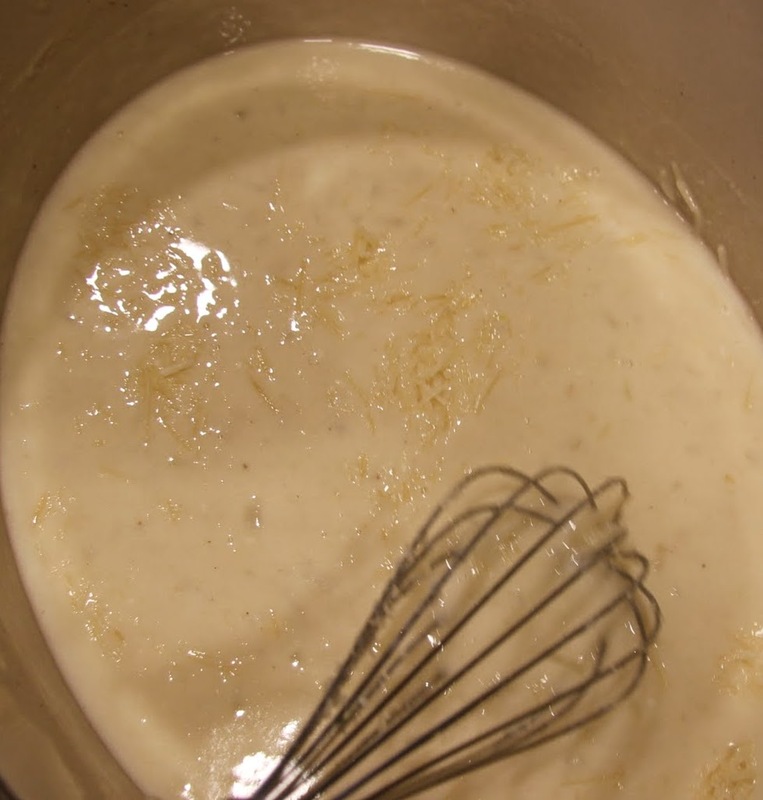 Once the sauce has thickened add Dijon mustard and 3/4 cup of parmesan cheese. Stir until smooth. 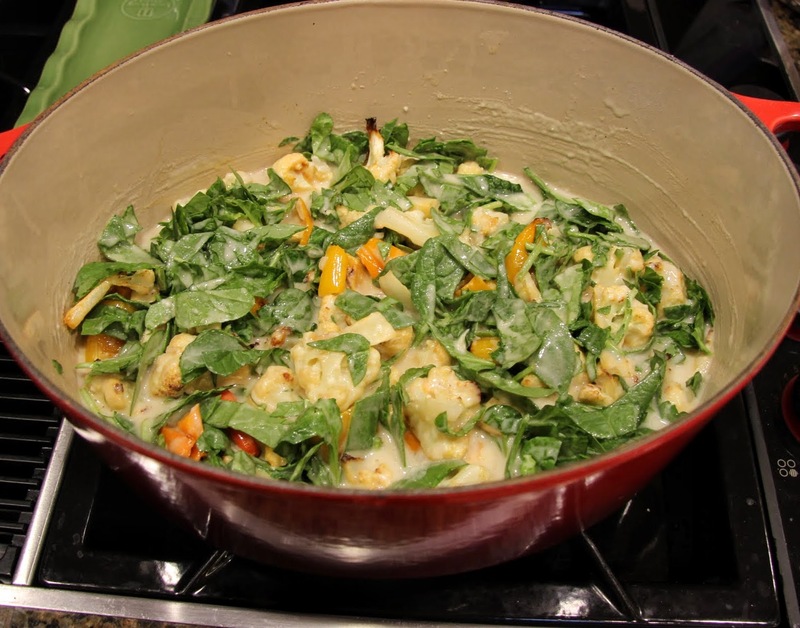 Stir in the roasted vegetables. 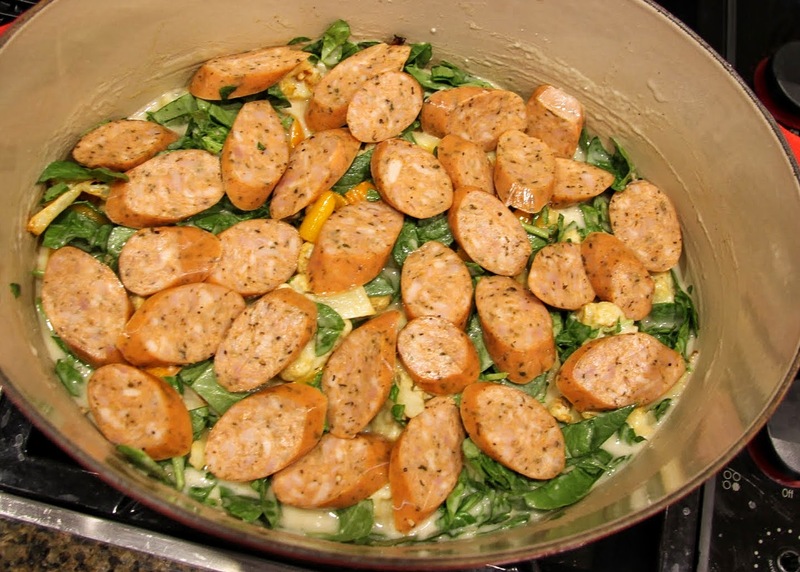 Stir in spinach, then add a single layer of sausage over the top as shown below. 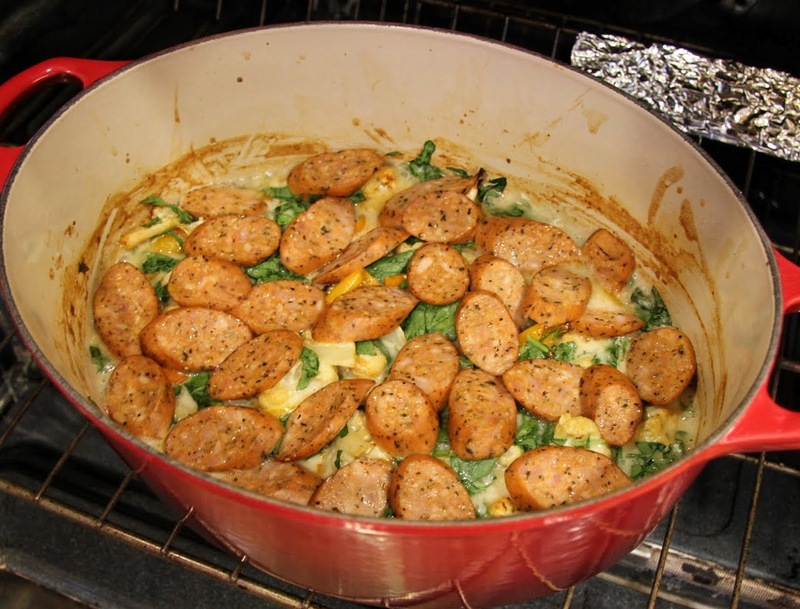 Bake in preheated 375-degree oven for about 15 minutes, until the edges are bubbling and the sausage begins to brown. 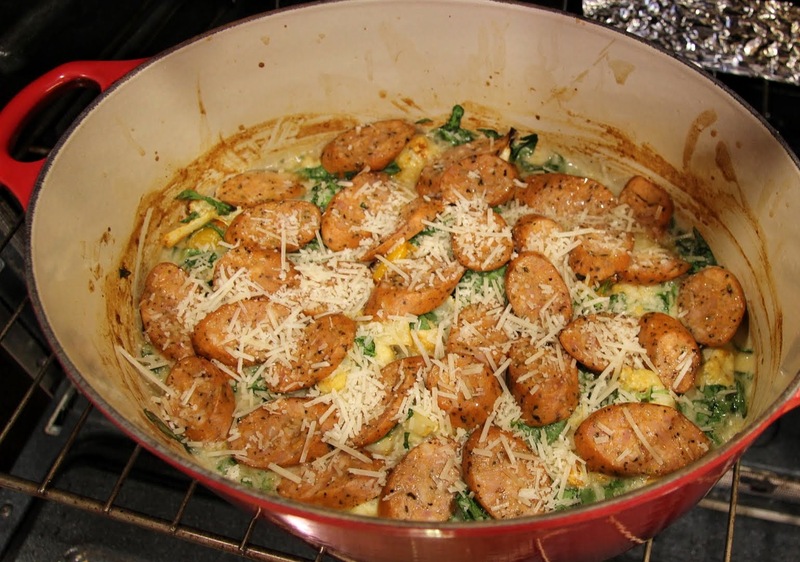 Top with remaining 1/4 cup of cheese and bake for another 5 – 10 minutes, cheese should be golden brown. 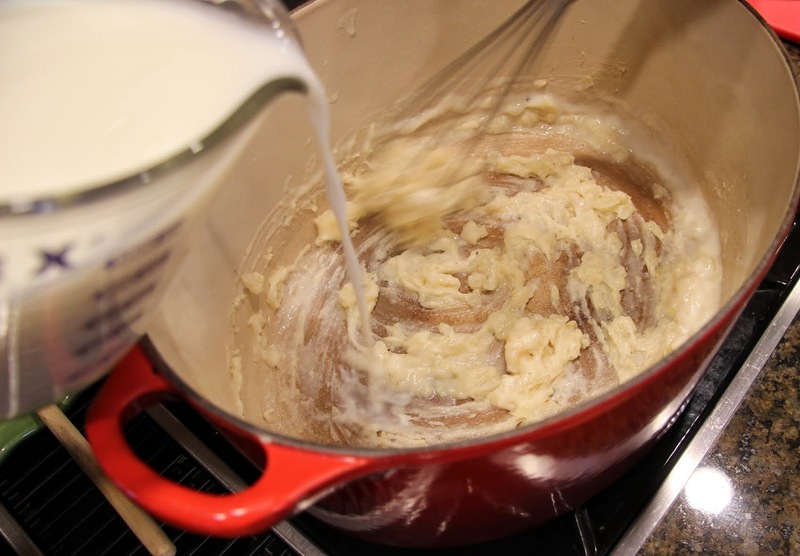 Remove gratin from the oven and allow to rest for at least 5 minutes before serving. 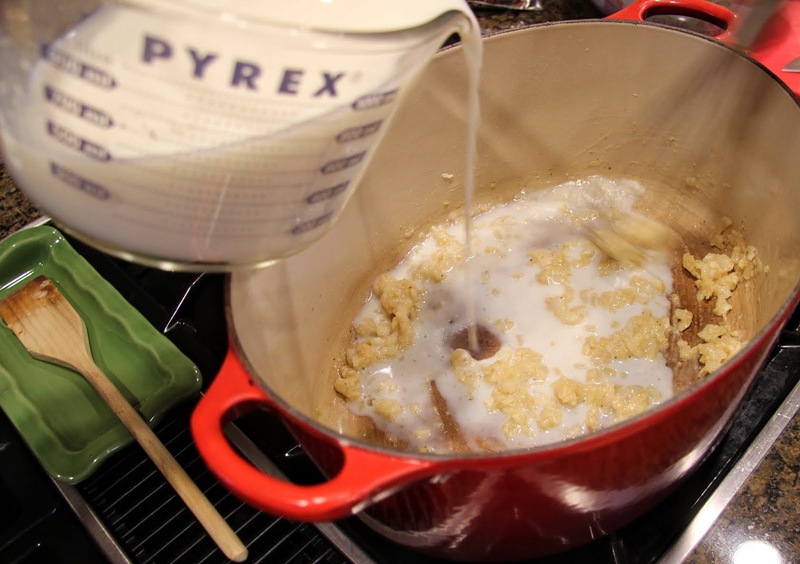 The longer you leave it, the more it will thicken up and hold together. We were hungry so we dug right in. 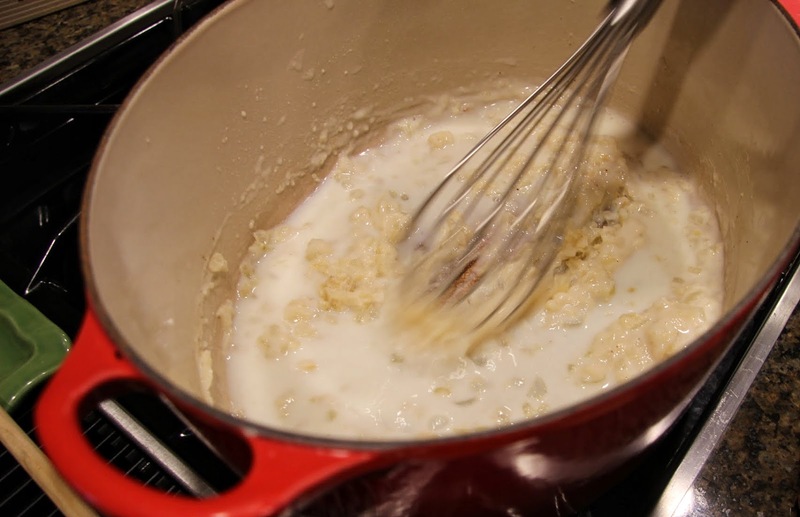 If you like, serve it over quinoa, rice or pasta. 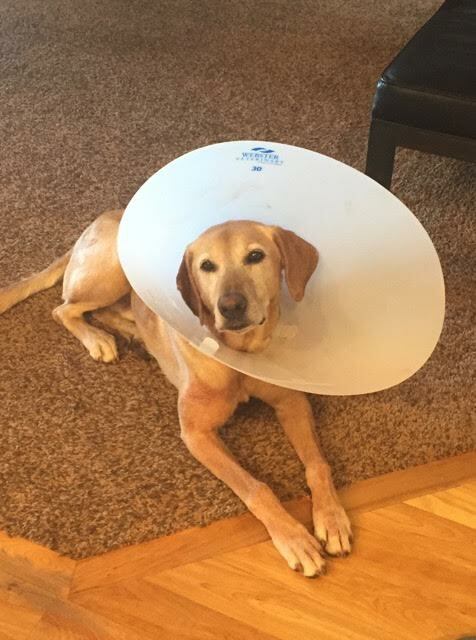 He’s fine… Cut his tongue playing fetch last week. I just like the picture.